Triple T Outfitting of Miles City, Montana started guiding hunting adventures in Montana in 1993. Triple T Outfitting founder and guide, Todd Steadman, started the operation not as a business venture, but rather as a way to share his unique vision of the Montana hunting experience with others. Todd had some very specific ideas about the way a guiding service should operate, and over time he has seen his ideas bear rewarding fruits in the form of countless satisfied guests, and strong relationships formed during the distinctive camaraderie of Triple T adventures. With thousands of private, game-rich acres and premium fishing locations — and a luxurious bunkhouse that very comfortably accommodates six guests, Triple T Outfitting is the perfect destination for a truly private and rewarding Montana hunting adventure. All of our guided hunts are conducted exclusively on private land. Our guides are highly experienced and utterly enthusiastic about hunting – and guiding our guests to their quarry. Triple T Outfitting each year offers a very limited number of guests a world class Montana hunting adventure at well below market cost. Guests can hunt both antelope and deer during the early hunts – or deer only during the peak of the rut, later in the season. 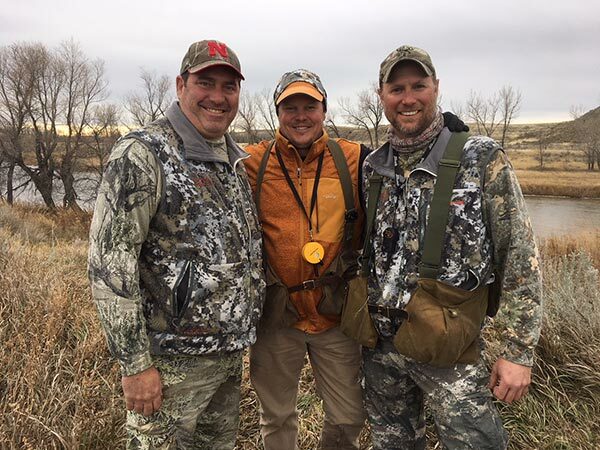 If a guest’s tag is filled before the hunt is over, Triple T Outfitting will provide other hunting adventures including upland game, waterfowl, predators and varmints. Superb accommodations, successful hunts, hot meals and great fellowship are all earmarks of a Triple T Outfitting adventure. View our successful hunting adventures photo gallery! Wild Game Feed: An annual event hosted by Triple T Outfitting that features assorted wild game gourmet dishes prepared by Chef Todd Steadman.